The Seven Steps – What do they represent? 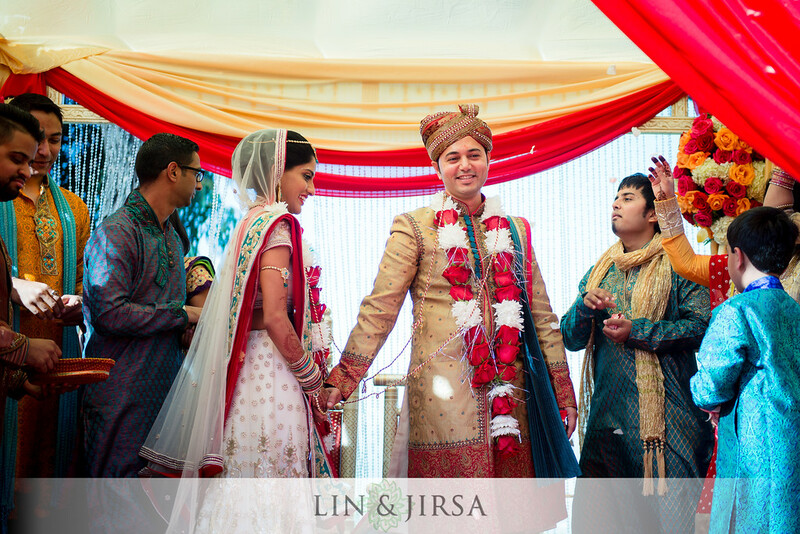 This portion of the ceremony takes places following the tying of the Mangalsutra (hyperlink) and establishes the commitment the couple makes to each other during the Hindu wedding ceremony. Saptapadi quite literally translates from Sanskrit to ‘seven steps’. 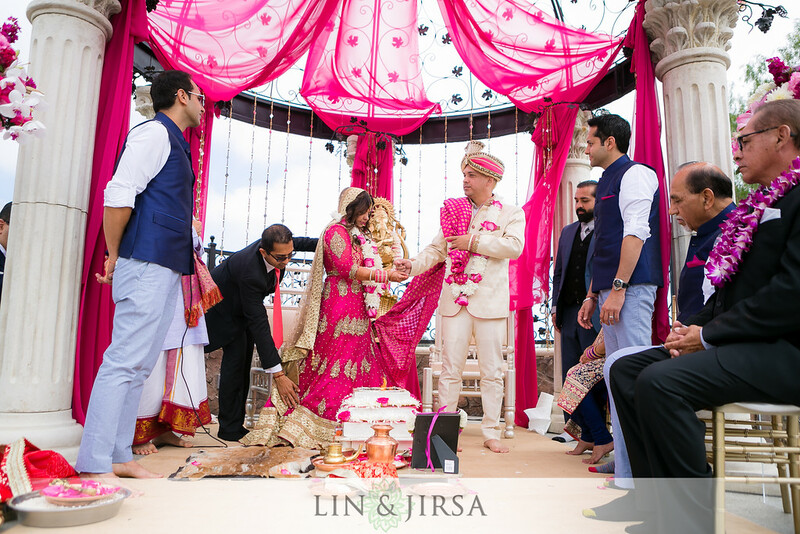 Many are familiar with images across the Internet of Indian Brides leading their Grooms around the fire pit at the Mandap, but few know the significance of these steps. The couple takes seven full circles, walking clockwise around the agni, representing the seven principles and promises they make to each other; each step is referred to as a ‘phere’. They are tied together with the dupattas, or chunis, from the Granthi Bandhanam ritual, which is used to keep the couple united as they make their rounds. Although there is no literal part of the ceremony that represents the Western mentality of vow exchanging, these seven steps parallel that ideal in that the couple ‘vows’ to successfully fulfill these principles during their married life. The following is a list of the promises the couple makes as they complete each full circle. While the couple is making their rounds, the priest dictates mantras pertaining to each specific phere. The Groom takes the pinky finger (or hand) of his Bride and leads her for the first four pheras, and then they switch places and the Bride finishes the last three by leading him to the culminating step. 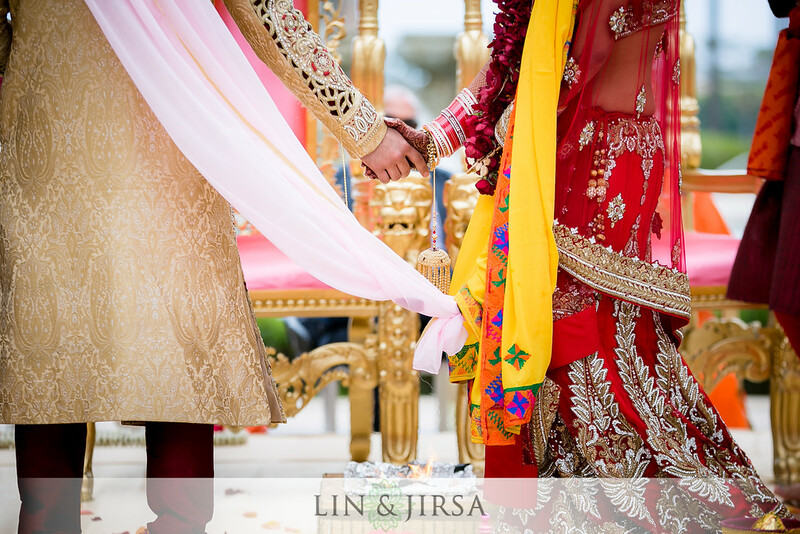 Each of these pheras signifies a specific meaning for both the Bride and Groom – complementary meanings that ensure that they will work as a unit to make this marriage successful, healthy, and prosperous. 1. Let us provide for our household, stay in good health and carry out our duties and responsibilities to each other, our families and our tradition. 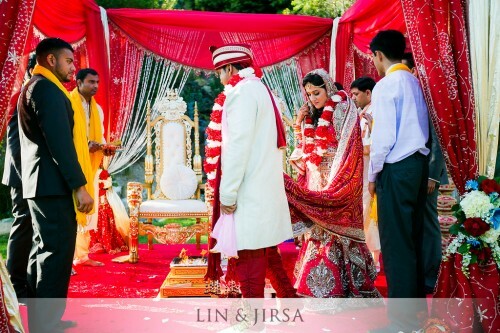 While the couple makes their rounds, family members that are present on the Mandap bless the couple with rose petals and rice, celebrating a pivotal part of the ceremony. After the Bride and Groom have made the seven rounds, they seek blessing from Lord Vishnu, the preserver, and Lakhsmi, the goddess of wealth. It is said that the couple has tied themselves together for seven lifetimes to come once this part of the ceremony is finished. Some regions of India finish the ceremony off by having the bride touch seven beetlenuts in turn with her toe, while her groom helps her keep her balance. There are many regional differences that occur in the execution of this ritual. In South Indian tradition it is customary that the couple take seven steps due south, with the Groom leading his Bride by her pinky finger around the fire. The alternating positions of the couple, as well as who is leading each step, varies across the country based on region and religion.